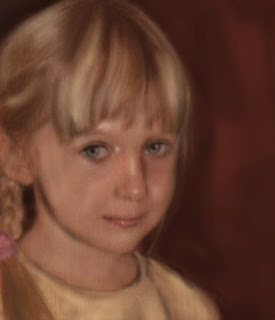 Tonight I started working on a portret of my niece. This is just underpaint. She is challenging because she is so pale, blond, almost white hair and a very light blue eyes. Not much contrast at all. I will give it a try. I like where this is going....will we get to see the finished piece? I hope so. Dorota portret jest piekny, bardzo sie nam podoba. Jest namalowany w stylu, ktory lubie, Paulina bedzie zachwycona. Thank you John. In this case maybe I should stop before I ruin this. Thank you Kim. I need to finish this one soon. No! Don't stop! Keep going. This is great. And it can only get better! Eric- thank you and you're right- it can't get any worse.